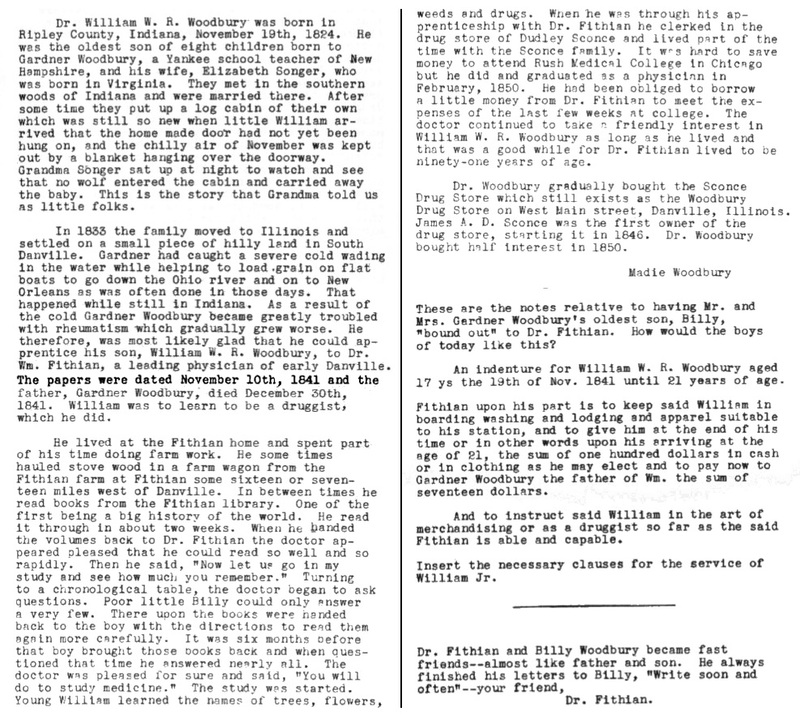 "New Hampshire Death Records, 1654-1947," database with images, FamilySearch (https://familysearch.org/ark:/61903/1:1:FSLV-DLD : 12 December 2014), William Woodbury, Mar 1866; citing Thornton, Bureau Vital Records and Health Statistics, Concord; FHL microfilm 1,001,116. Your Woodbury/Ober Family Web Site at http://www.woodburyober.com/, d9.html. 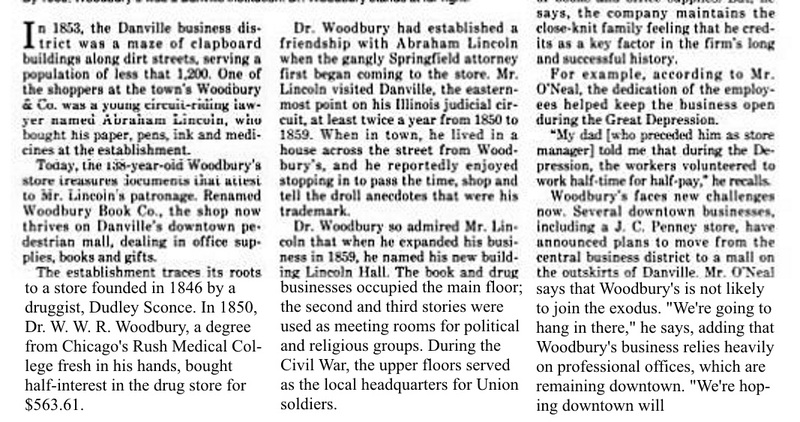 William W. R. Woodbury was born on November 19, 1824 in Ripley County, Indiana. He was the son of Gardner Woodbury and Elizabeth Songer. Clarence A. Torry, New England Marriages Prior to 1700, Baltimore, MD: Genealogical Publishing Co., (2004) , p. 148. Vital Records of Chelmsford Massachusetts to the end of the year 1849, , at http://ma-vitalrecords.org/MA/Middlesex/Chelmsford/ . Salem, Mass. : The Essex Institute, (1914) , p. 166. Thomas W. Baldwin, Vital Records of Cambridge, Massachusetts, to the year 1850, Boston: Wright & Potter Print. Co., (1914) , Vol. 2, p. 73. Vital Records of Wenham, Massachusetts to the end of the year 1849, Salem, Mass. : The Essex Institute, (1904) , Vol. 2, p. 336. Vital Records of Wenham, Massachusetts to the end of the year 1849, Salem, Mass. : The Essex Institute, (1904) , Vol. 2, p. 471. Vital Records of Chelmsford Massachusetts to the end of the year 1849, , at http://ma-vitalrecords.org/MA/Middlesex/Chelmsford/ . Salem, Mass. : The Essex Institute, (1914) , p. 350. Vital Records of Chelmsford Massachusetts to the end of the year 1849, , at http://ma-vitalrecords.org/MA/Middlesex/Chelmsford/ . Salem, Mass. : The Essex Institute, (1914) , p. 457. 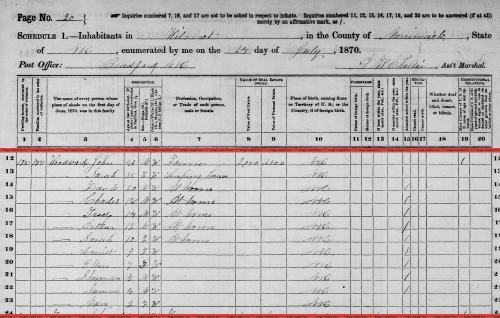 Olive married Thomas Preston Woodward, son of Caleb Woodward and Eunice Rice, on January 31, 1850 in Washington, Sullivan County, New Hampshire. 1880 United States. Census Office. 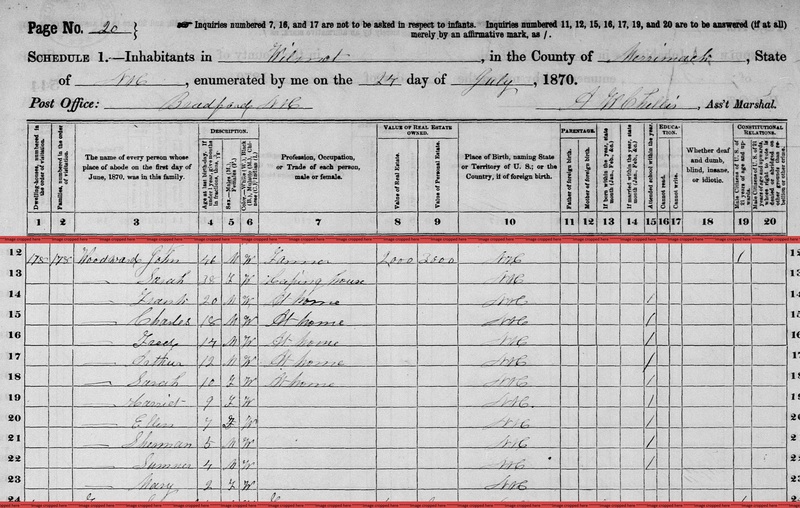 10th census, 1880 federal population census, Washington, District of Columbia: National Archives and Records Service, ([19--]) , Census Place: Washington, Sullivan, New Hampshire; Roll: 768; Family History Film: 1254768; Page: 414A; Enumeration District: 279; Image: 0834. (?) Woodward was born on October 1, 1886 in Washington, Sullivan County, New Hampshire. She was the daughter of George E. Woodward and Etta A. Seavey. 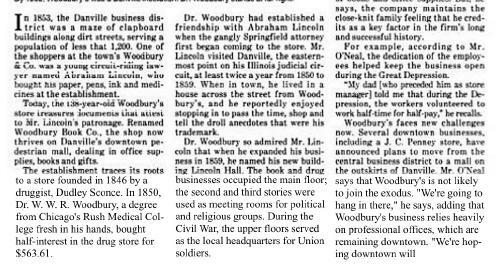 (Stillborn) Woodward was stillborn on September 18, 1876 at Wilmot, Merrimack County, New Hampshire. She was the daughter of Caleb Woodward and Hannah Cheever. Brookline (Mass. ), Vital Records of Brookline, Massachusetts, to the end of the year 1849., Salem, MA: The Essex Institute, (1929) , p. 171. "Massachusetts Deaths and Burials, 1795-1910," database, FamilySearch (https://familysearch.org/ark:/61903/1:1:FH5K-JXQ : 10 December 2014), Wilson, 28 Aug 1793; citing West Roxbury, Suffolk, Massachusetts, reference 17; FHL microfilm 741,321. Abraham Woodward was a partner in the Land Bank of 1740, Suffolk County, Mass. Roxbury (Mass. ), Vital records of Roxbury, Massachusetts, to the end of the year 1849, Salem, Mass. : Essex Institute, (1925) , Vol. 2, p. 322. Brookline (Mass. ), Vital Records of Brookline, Massachusetts, to the end of the year 1849., Series: [Essex Institute, Salem, Mass. Vital records of the towns of Massachusetts. ], Page: 244 p. 23 cm., p. 172. She was buried on July 4, 1886 in Forest Hills Cemetery, Jamaica Plain, Massachusetts, Apparently buried in same location as W. Elliot Woodward. Massachusetts Vital Records, 1841-1910, , Vol: 375 ; Page: 169. Massachusetts Vital Records, 1841-1910, , Vol: 324 ; Page: 117. "United States World War I Draft Registration Cards, 1917-1918," database with images, FamilySearch (https://familysearch.org/ark:/61903/1:1:KZJ7-K9H : 12 December 2014), Alvin Arthur Woodward, 1917-1918; citing Merrimack County no 2, New Hampshire, United States, NARA microfilm publication M1509 (Washington D.C.: National Archives and Records Administration, n.d.); FHL microfilm 1,711,852. 1910 United States. Bureau of the Census. 13th census, 1910 population census schedules, Washington, District of Columbia: Bureau of Census Micro-Film Lab, ([19--?]) , Census Place: Franklin Ward 1, Merrimack, New Hampshire; Roll T624_864; Page: 6A; Enumeration District: 211; Image: 598. "United States Census, 1930," database with images, FamilySearch (https://familysearch.org/pal:/MM9.3.1/TH-1942-22754-10611-2?cc=1810731 : 8 December 2015), Massachusetts > Middlesex > Arlington > ED 161 > image 20 of 38; citing NARA microfilm publication T626 (Washington D.C.: National Archives and Records Administration, 2002). Andrew married Sarah Stone, as his first wife. "Massachusetts Town Records, ca. 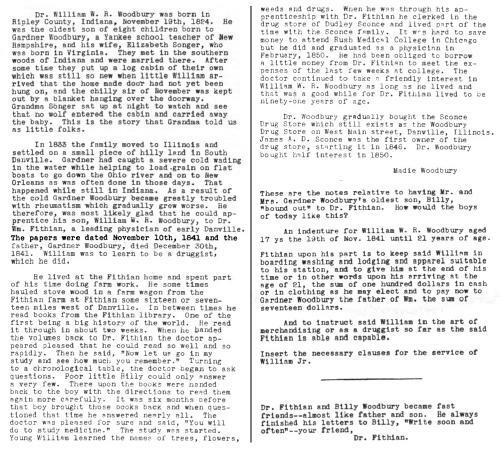 1638-1961," database with images, FamilySearch (https://familysearch.org/ark:/61903/1:1:FHZB-QPQ : 20 April 2016), Andrew J Woodward and Charlotte Woodward, 20 Jul 1871; citing West Roxbury, Suffolk, Massachusetts, United States, Town clerks and local churches; FHL microfilm 741,321. "United States Social Security Death Index," database, FamilySearch (https://familysearch.org/ark:/61903/1:1:JT5X-BWP : 19 May 2014), Arline I Woodward, 26 May 1999; citing U.S. Social Security Administration, Death Master File, database (Alexandria, Virginia: National Technical Information Service, ongoing). 1930 United States. Bureau of the Census. 15th census, United States, 1930 federal census : population schedules ; NARA microfilm publication T626, Washington, District of Columbia: Bureau of the Census Micro-Film Laboratory, ([19--?]) , Census Place: Franklin, Merrimack, New Hampshire; Roll: 1304; Page: 9A; Enumeration District: 0034; Image: 200.0; FHL microfilm: 2341039. Arthur B. Woodward was born on March 1, 1858 in Wilmot, Merrimack County, New Hampshire. living at Wentworth, Grafton County, New Hampshire. Between 1883 and 1890, Arthur B. Woodward was a farmer. In 1894, Arthur B. Woodward was a lumberman. Between 1896 and 1897, Arthur B. Woodward was a farmer. In 1898, Arthur B. Woodward was a laborer. In 1899, Arthur B. Woodward was a needlemaker. 1900 United States. Census Office. 12th census, 1900 population census schedules, Washington, District of Columbia: Bureau of the Census Micro-Film Laboratory, ([197-]) , Census Place: Franklin Ward 1, Merrimack, New Hampshire; Roll: T623 949; Page: 3A; Enumeration District: 163. 1880 United States. Census Office. 10th census, 1880 federal population census, Washington, District of Columbia: National Archives and Records Service, ([19--]) , FHL Film 1254765; National Archives Film T9-0765; Page 433D. "New Hampshire Birth Records, Early to 1900," database with images, FamilySearch (https://familysearch.org/ark:/61903/1:1:FL5S-KDM : 12 December 2014), Hamet Woodward, 09 Apr 1894; citing Waterville Valley, Grafton, New Hampshire, United States, Bureau of Vital Records and Health Statistics, Concord; FHL microfilm 1,001,056. "New Hampshire Birth Records, Early to 1900," database with images, FamilySearch (https://familysearch.org/ark:/61903/1:1:FL5S-2V8 : 12 December 2014), Dorris Evelyn Woodward, 11 Oct 1900; citing Franklin, Merrimack, New Hampshire, United States, Bureau of Vital Records and Health Statistics, Concord; FHL microfilm 1,001,056. "New Hampshire Birth Certificates, 1901-1915", database with images, FamilySearch (https://familysearch.org/ark:/61903/1:1:Q2SD-J9RZ : 18 April 2016), Woodward, 1907.